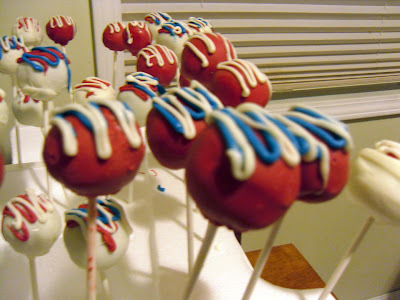 The first thing that popped into my head (no pun intended) of what to make for our annual 4th of July bash was cake pops. I reserve them for special occasions since they take so long to make and this seemed like a good time to whip some up. This batch was my second time making them and I'm happy with how they turned out. I didn't go for anything cutesy this time like I did in my first attempt of Easter Cake Pops, I just went for straight-forward festive pops. I also made my own frosting to mix in since the store-bought ones are way too sweet for my liking. The recipe follows. Along with the fun of making cake pops comes the dilemma of how to present them. This can pose a challenge when you don't want to spend much money. 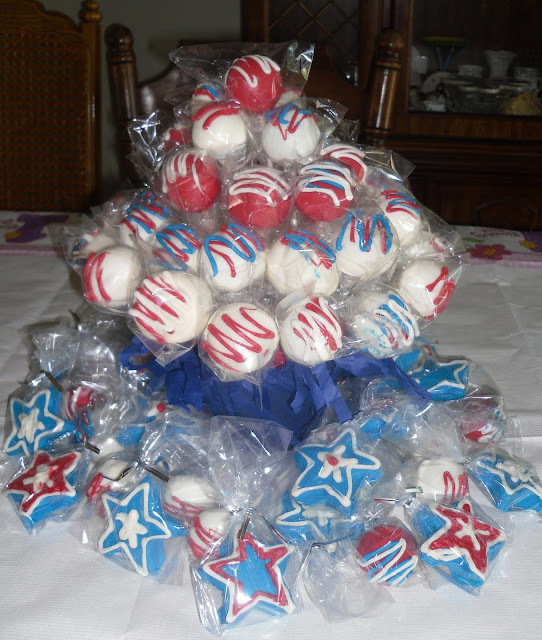 I had planned on having them set up on a sheet of styrofoam in the form of a flag but my stars weren't on sticks so that wasn't going to cut it. I even asked my dad (who can pretty much get anything you could ever need) to save me some scraps from work. After all the pops were complete, I had an idea that wouldn't cost me any money because I already had everything on hand. I took a flower pot, some blue and red tissue paper, and rubber cement (a must-have for any crafter) and created my 4th of July flower pot. Considering I didn't spend any money, it was perfect! The first step to making some tasty cake pops is to gather everything together. You definitely don't want to run out of anything or stop in the middle to make something that you forgot. 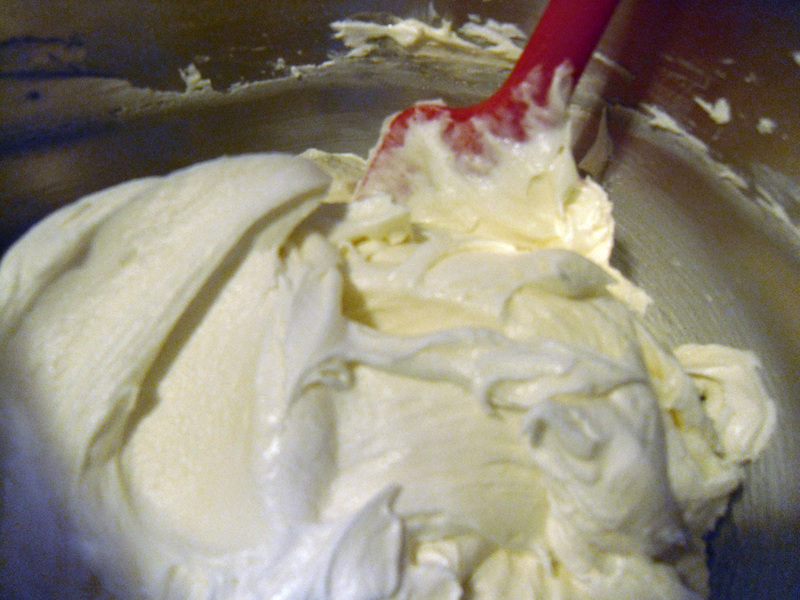 Beat butter and vanilla in mixer using whisk attachment. Add sugar 1 cup at a time, mixing in between. After all sugar has been incorporated, beat for a few minutes until fluffy. This recipe will make 4 1/2 cups of frosting. Cook cake according to directions on package in 13x9 inch pan. Allow to cool completely. I usually make it the day before and let it cool overnight. After the cake is cooled, crumble it into very small pieces. Remove any hard edges or really dark areas. Mix about 1 1/2 cups of frosting into the cake crumbs with the back of a large spoon. Add 1 cup first and then add the remaining a little at a time so the cake doesn't become too wet. If it gets too moist, the balls won't stay formed. Be sure to mix it very thoroughly. are too cold when the candy coating is applied, it will crack when they start to thaw. so the cake doesn't touch. Once dried, decorate and present them however you'd like.